Indian government has released new 100 rupee notes which feature the motif of ‘Rani ki Vav’ stepwell on the reverse side. 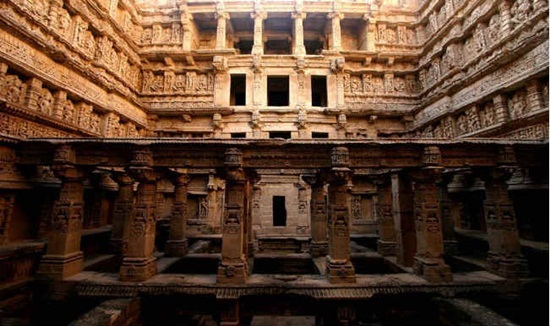 One of the most historic and best tourist attractions in Gujarat, Rani ki Vav is a unique architectural wonder. It was built as an inverted temple in homage to the sanctity of water. Those who have watched Amol Palekars Paheli do remember the stepwell scene in Rajasthan featuring Rani Mukherjee as a newlywed bride who halts on the way to her in-laws and feels a mystic presence around herself. There are many stepwells in Gujarat and Rajasthan, the Rajputana states of India. But, Rani Ki Vav stepwell is more exquisite, magnificent and marvelous than other stepwells. 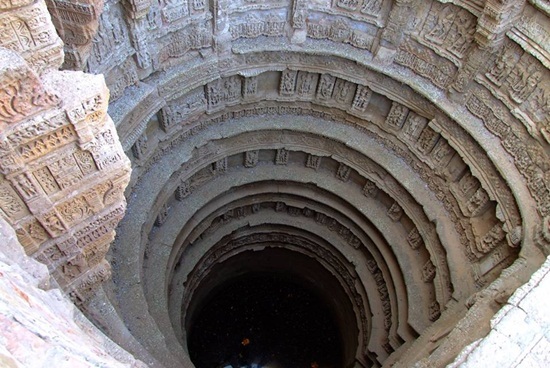 In 2014,UNESCOs list of World Heritage Sites in India incorporated Rani Ki Vav which is also known as Queens Stepwell. UNESCO recognized Rani Ki Vav as a masterpiece of technological excellence in ground water management in the 11th century. This stepwell is an age-old model of how ground water was preserved and utilized in those days. In additional to this, Rani Ki Vav is a work of Indian subterranean architecture with ornamental sculptures. The stepwell is a seven-storied structure underground. It measures about 64 meters in length, 20 meters in width and 27 meters in depth. As the history goes, Patan where the stepwell is located was the capital of Gujarat when King Siddharja Jaysingh was in power. Then, it was known as Anhilpur Patan. The construction of Rani Ki Vav was commissioned in the Solanki or Chalukya regime. It is said that the stepwell was built as a tribute to Bhimdev the First whose father had founded the Solanki dynasty in 1050 AD. The construction was proposed by the queen Udayamati, wife of Bhimdev the First. Sculptural beauty is the mainstay of Rani Ki Vav as a historic attraction for tourists. The inner walls, pillars and columns are intricately sculpture. Most of the sculptures represent the incarnations of Lord Vishnu Rama, Krishna, Narasimha, Varah, Baman, Matsya, and Kalki. The other sculptures are shaped as beautiful dancing women of the Heaven including Nagkanya, Yogini and Urvasi. There are nearly 1000 sculptures. A carving of Lord Vishnu resting on the thousand-hooded serpent named Sheshnag is found at the water level. After years of its construction, the stepwell was flooded by the Saraswati River and filled with silt. It remained covered with silt till the late 1980s. Then, the Archeological Survey of India discovered and excavated it. Rani Ki Vav with most of the carvings in pristine condition is an interface between a stepwell and a temple. It resembles a subterranean temple with carvings of deities in stone, which symbolizes the age-old faith in sanctity of water. Such stepwells were the sites for not only water preservation and distribution but also worship and socialization in the bygone eras. The steps lead to the deepest bottom through several pillared pavilions. The lowermost step ends at a small gate which opens to a 30-km tunnel. It is supposed to have been used as an escape to the nearby town Sidhpur in times of invasion by enemies. The World Heritage Site status has made Rani Ki Vav the queen of stepwells in India, for its sheer magnificence, intricate carvings, celestial sculptures, and water-preserving technology. ‘Rani Ki Vav’ stepwell in Patan district of Gujarat is a 125-km long drive from Ahmadabad and 118 kms away from Gandhinagar. Modhera, the ancient Sun Temple, is another must-visit tourist attraction on the way. These days cheap flights to Ahmedabad International Airport are available for online booking throughout the year.